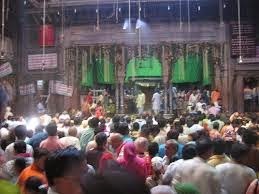 Here is Some Information about Shahji Temple in Vrindavan Uttar Pradesh Indian. 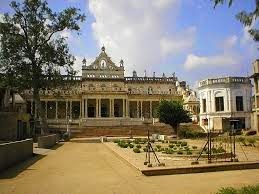 Shahji Temple is located in Vrindavan Mathura in Uttar Pradesh.The Temple is Dedicated to Lord Krishna and Radha.The temple was designed and built by Shah Kundan Lal, who was a wealthy jeweller of Lucknow. The deity of Lord Krishna enshrined at this temple is known as Chhote Radha Raman.This old temple in Vrindavan was built in 1660 A.D. ar rebuilt in 1876 A.D. It is known for its architecture, sculpure and marble spin columns, the basanti kumra, decorated with paintings and chandeliens, is the eastern wing of the temple.Vrindaban is famous for its thousends of temples. Known for its beautiful architecture and marble sculpture, this temple attracts several tourists from around the world. The temple features twelve spiral columns, each of which is 15 ft high. Another highlight of this temple is Basanti Kamra, which is darbar hall featuring Belgian glass chandeliers and beautiful paintings. Shahji Temple, Vrindavan has been constructed by the wealthy merchant by the name Shah Kundan Lal of Lukhnow. This was done in the year 1876. 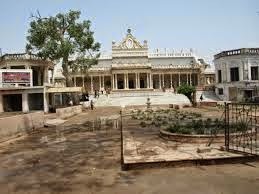 It is one of the most important Tourist Attractions in Vrindavan. By Road: Vrindaban is well connected by road to the rest of Uttar Pradesh and India. By Rail: The Nearest Railway station is Mathura Junction. By Air: The Nearest Airport is Agra(73 Km).